Old cabin deep in the woods with half a bicycle. Oh the stories such places could tell. There was plenty of variety in today's hike. I was glad to be in the woods after finishing the last three miles of road walk between Gold Head Branch State Park and Etoniah Creek State Forest. ... and a recently clear cut area and lastly a place with lots of big dead live oaks with no clear cause for the widespread death. The weather had turned very pleasant after a morning low in the low 50’s. It was up to the low 70’s, calm, and fairly humid as I wandered the very different southeastern half of the State Forest and adjacent private hunt club lands along Etoniah Creek proper. The hunt club areas had plenty of deer stands and plenty of evidence of gun activity. Some wahoo had recently shot this tree dead. The slugs of lead were there to prove it. What an idiot. Going south the trail comes out on Carraway Mail Route Road—I love that name. That road is gated for the northern two miles and open to the public south of that. The gated part is very lightly used so almost felt like foot trail. North of the road, the trail is in the woods and follows Etoniah Creek for three miles or so. Here's the view from the footbridge where the northbound hiker first reaches the creek. This was a very pretty walk but with limited views of the stream and not very many outstanding photo opportunities. The trail rises up onto some high bluffs overlooking the creek. Here I could make out a big sweeping 'S' curve in the creek. North of there the trail leaves the creek at another footbridge. There the Iron Bridge Shelter stands in a piece of deep woods and old trees that one writer, in the shelter log book, called 'a powerful place'. I can't disagree. Within a mile of the State Forest's central trailhead I ran into ‘BushWhacker’ again. This will probably be a regular thing as he's hiking southbound and I'm hiking each leg northbound but also working my way southbound--that makes for ample opportunity to cross paths. He wanted my trail report, hoping to go beyond the Iron Bridge Shelter that I had just passed so he could put in more miles. He wanted to know if there were good camping areas, and as far as I knew there weren’t, so I think he decided to stay at the shelter. 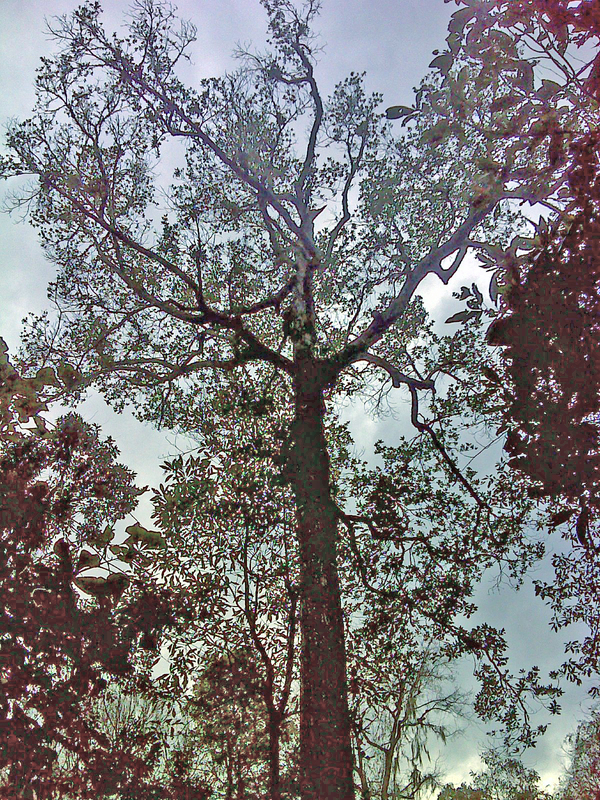 Anyhow, soon after parting ways with him I took the side trail to see the national Champion Loblolly Bay tree. Apparently Loblolly Bay trees don’t ever get too big. 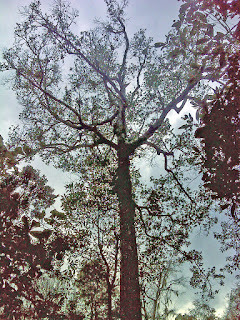 This was a big tall tree, but by standards of most hardwood species it was just ‘ordinary big’, not ‘champion big’. It was less than four feet in diameter at chest height. I ended the day hiking a leg between Rice Creek Conservation Area and Carraway Mail Route Road that is back on the Palatka to Lake Butler Rail Trail. This is the place where the pavement ends. The trail is grassy rail bed from there to Palatka and is wide beautiful paved greenway/bike path north to Keystone Heights. The paved rail trail ends here at a big parking area used by lots of bicyclers. It was a cloudy day, warmer and more humid than the crisp frosty days I've been experiencing for a couple days. It almost felt as though winter had turned the corner to spring, and these deciduous azalea buds seemed to be responding--the flower heads were noticeably swelling. By the end of the day I had put in eighteen extremely varied miles. Love it. Here's the map of today's route with links to more photos.